Welcome, toons of Corporate Clash, to our backstage posts! This is a new section we’ve wanted to create for a while now, and it’s finally here! This is where we’ll be sharing behind the scenes look at developments in Corporate Clash -- past and present, AND provides a place where we can get feedback from the players like you to help us make the decisions you guys want! With that being said, the main focus of this backstage post is to show you guys the progress we’ve made with the Outback species, as well as a few other potential tweaks we have upcoming. We’ve been making great progress with the Outback species, as shown in the pictures attached. 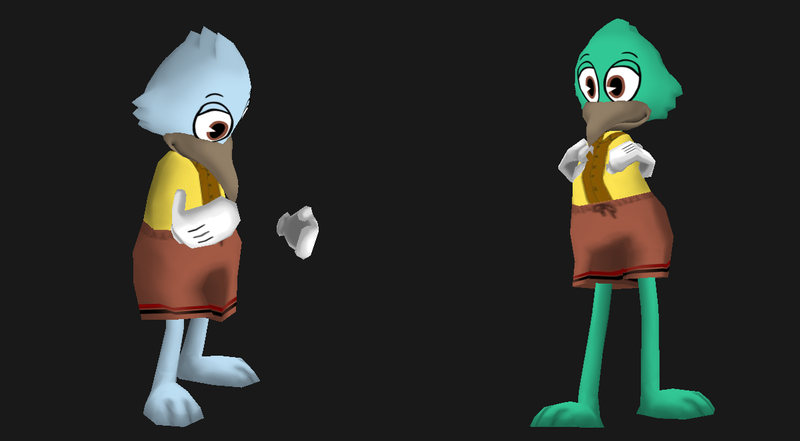 Kiwi toons, as you see, have been completed and have entered the testing phase. Corporate Clash development is full speed ahead for our feature-packed 1.1 update! You may even notice a new detail in these screenshots that we’ve been toying with. This is an experimental step in opening up new routes for toon customization! Not to mention some other new ways to customize some things coming in the 1.0.9 update this weekend. That’s right! Eye colors. And before you ask, these experimental eye colors would include a short list of pre-approved colors, to prevent extremely unnatural or jarring colors to be chosen. This is a prime feature that we’re glad we can share with you, as it requires feedback! This isn’t something guaranteed to be implemented just yet, as we need to know if this is something the majority of Corporate Clash players would enjoy! If we find the feedback positive, we just may go forward with this added form of Toon customization. Expect this tweak -- if approved, to be released alongside the Outback species in the 1.1 update. Tacking onto this, we understand some players may have questions about existing toons when Outback species release. Considering the potential wishes to play as some of these new species, as well as perhaps wanting to customize your toon’s eye color, we will be looking into ways to allow for a player to seamlessly re-customize their toon in the 1.1 update to a new species, and to a new eye color, if approved. So please, if you have ANY feedback at all. Good or bad, feel free to send us an email at [email protected] and give us the full extent of your thoughts. We’re looking forward to it! Happy Thanksgiving, and we hope to see you soon! All content copyright Backstage Corporate Clash © 2019 • All rights reserved.